I was down at the Tobacco Patch last night chatting with the gang and discovered that they're having an event this coming Friday. Check it out! Lit Newsletter 9/21/12 Event this Monday! 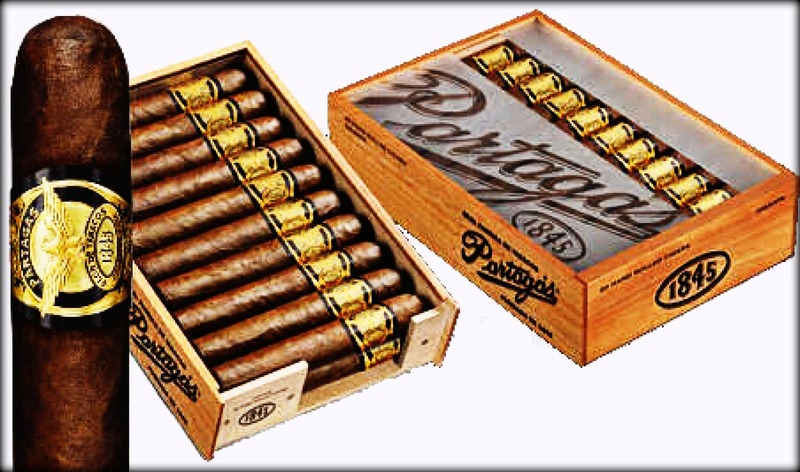 Jack Daniels/Partagas 1845 Event this Monday! Join us on Monday, September 24th from 5-9pm as we feature the Jack Daniels family of brands along with Partagas 1845 cigars. Whatever your favorite is, we'll have deals on all Jack products, from Old #7 to Gentleman Jack to Single Barrel to the new Tennessee Honey. We'll be showing the Seahawks' appearance on Monday Night Football and will be joined by the Jack Daniels girls! Enjoy great specials on all Jack Daniels products as well as deals on Partagas' newest blend, the medium bodied, full flavored 1845. We'll have prizes to give away all evening long and did I mention Jack Daniels girls? See you there! 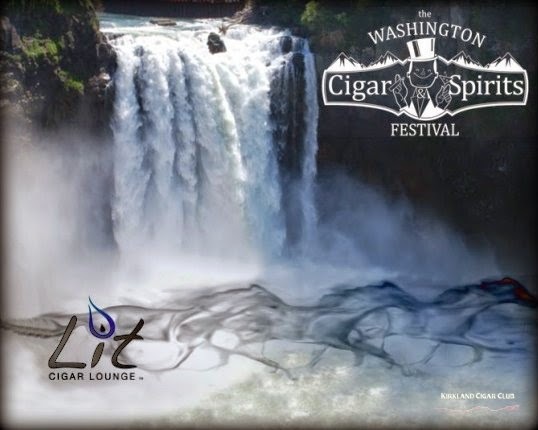 Over the next few weeks as we countdown to the Washington Cigar & Spirits Festival (October 13 is coming soon! ), we're going to highlight some of the specific vendors and products that we'll be featuring during the event. This week, it's Toraño Family Cigars. We'll be one of the first accounts in the country to have the brand new Toraño Salutem cigar. What's Salutem, you ask? I'll let Charlie Toraño explain. 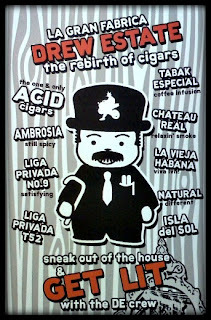 I met up with him at the IPCPR show in Orlando and he told me all about this exciting new blend. Be one of the first in the country to try Salutem as well as several other great blends from Toraño at the Washington Cigar & Spirits Festival. Tickets are now on sale via Ticketmaster and at the Casino Box Office. For more information on this event, click here to visit the WCSF page on the casino website with all of our vendors and details. 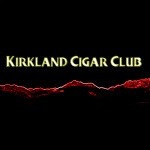 Anyway, my good friend Sir Godfather with the 10-7 Habaneros Aficionados Cigar Club sent me an invite, but also an invite to all the Kirkland Cigar Club followers inviting us all to a Gran Event/Gala coming up in November. (BJ's Bingo Bldg. 2nd floor) Fife, WA. Men- Black Tie Event-Tuxedo or Suit required (jacket/slacks/tie) your choice. Women- Cocktail attire preferred (pants suits acceptable). 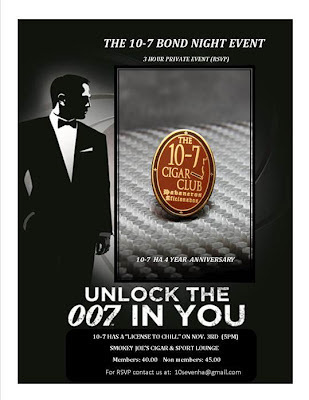 Dinner Buffett, Door Prize (4 tickets to "Sky Fall" movie premiere on Nov. 9th), free drink, free cigar, raffles with special prizes ,(Humidor, Bond memorabilia, cigars, and more),Special laser engraved martini glass,, James Bond Trivia with prizes, music, special prizes on spirits. My lovely bride and I will be there for sure and I hope that I see the rest of you guys down there as well. Believe me, if Sir Godfather is putting on an event, it's going to be First Class all the way! I can hardly wait! Montecristo Epic - The latest release from Montecristo is here! It's a limited release cigar, produced by a special team of Montecristo's most skilled and accomplished cigar makers. 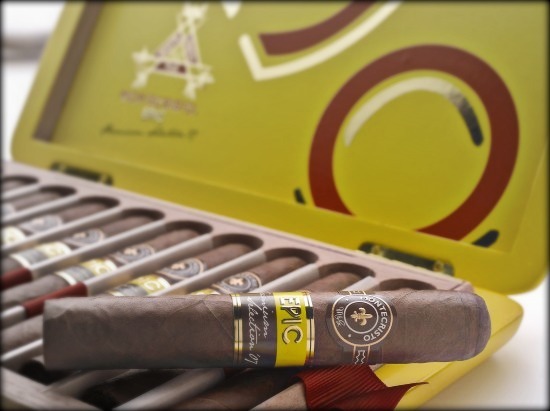 The Epic is a medium to full bodied cigar wrapped in a spicy Ecuadorian Habano wrapper, with all the tobacco selected from the vintage crop of 1997. 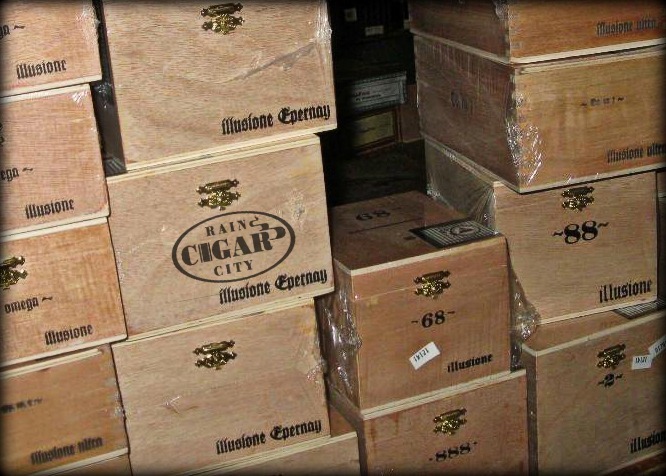 Each cigar is hand inspected and every box includes a Certificate of Authenticity, signed by the artisans at every step. J. Fuego Sangre de Toro & Origen Maduro - Jesus Fuego will be one of our guests of honor at the Washington Cigar & Spirits Festival, and these are two of his best and latest blends. The Sangre de Toro is a spicy Nicaraguan puro comprised of Corojo and Criollo seed tobacco. The Origen Maduro is a rich, complex blend of Nicaraguan, San Andres, and Honduran tobacco wrapped in a silky Brazilian Matafina maduro wrapper. EP Carrillo Inch- Fans of big ring guage cigars will love this 64 ring guage blend from the "Godfather of Boutique Cigars." It's a bit fuller bodied than the EPC core line and limited in production. HC Habano2-Called Habano Squared, this new box pressed beauty is produced in Nicaragua for Xikar by AJ Fernandez. It's affordable, powerful and complex. One of my favorite new releases of the year! We'll be showing the Seahawks' appearance on Monday Night Football and will be joined by the Jack Daniels girls! Enjoy great specials on all Jack Daniels products as well as deals on Partagas' newest blend, the medium bodied, full flavored 1845. Over the next six weeks as we countdown to the Washington Cigar & Spirits Festival, we're going to highlight some of the specific vendors and products that we'll be featuring during the event. This week, it's artist Tony Vinella. 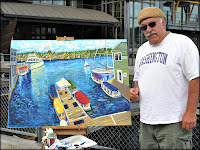 Tony is a cigar aficionado and a painter who works in the 19th century Impressionistic style. Vinella's paintings are painstakingly built using layer upon layer of oil paint to create depth and complexity. Each layer must be dried before the next is applied, giving the colors the luminous quality that the Impressionist were known for. 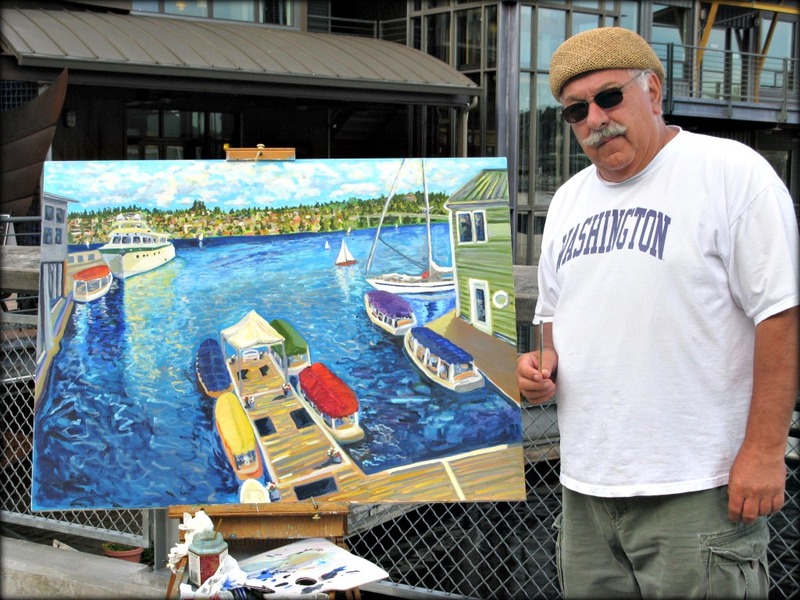 We'll be giving every ticketholder to the Washington Cigar & Spirits Festival a raffle ticket to win a custom cigar-themed Tony Vinella painting, valued at $2500! Meet Tony Vinella at the Washington Cigar & Spirits Festival. Tickets are now on sale via Ticketmaster and at the Casino Box Office. For more information on this event, click here to visit the WCSF page on the casino website with all of our vendors and details. Our sunny weather keeps going and going, and that's no Illusion! Our next event isn't an illusion either, but it is an Illusione event! Terry Coleman of Illusione cigars will be at our store for this event. Terry will be happy to speak about all things Illusione including the hot new 'Ultra' and 'Alpha & Omega' lines. 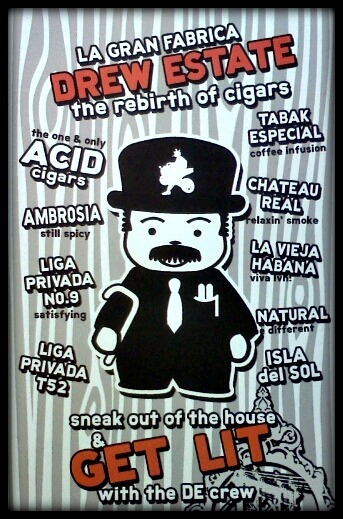 Come on down and check out what all the buzz is about this line of boutique Nicaraguan cigars. Terry will have a couple of deals going on all Illusione cigars, #1 When you buy any three Illusione cigars, Terry will add another. #2 When you buy a box of Illusione, Terry will add another six cigars! 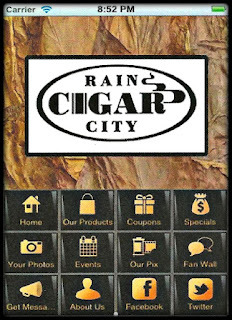 Have you tried our new Rain City Cigar mobile App yet? Load it today and be among the first to hear about special deals from Rain City Cigar! 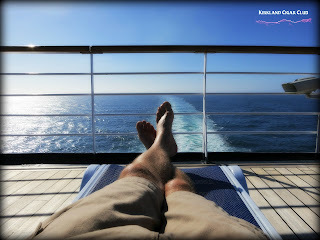 *Issues with the Android platform should now be resolved. For those of you who've come out to Lit to watch the Seahawks, you know why we're excited for another season to start. 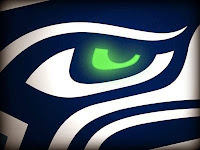 As we've done the past two years, we'll be giving away prizes each and every time the Seahawks score all season long! We're kicking things off with a special event on Sunday, September 9th. We'll be featuring Brickhouse cigars, including the brand new 6x60 Mighty Mighty Maduro, along with Glenrothes and Glen Grant single malt scotches. The game starts at 1pm, but our specials will go on all day. We'll have Buy 3 Get 1 Free on Brickhouse. For those who buy 10 sticks or more, we'll give you a free membership certificate to the JC Newman Cigar Connoisseur's Club - good for a t-shirt and a 4 cigar sampler of their cigars. Glen Grant Single Malt will be only $6, while Glenrothes Select Reserve will be $7.50 all day long. We hope you join us on Sunday, either to watch the Seahawks at 1pm, or later as we show the Sunday night game between the Steelers and Broncos. This week, it's Jesus Fuego. Jesus is one of the bright young talents in the cigar world. He first drew the attention of the industry as Rocky Patel's master blender during a period where Rocky was producing some exciting and interesting cigars such as the Vintage 1990 and 1992, RP Sun Grown and the Olde World Reserve. After leaving Rocky Patel in 2006, Jesus started his own company and has produced some exceptional cigars, including the HC Habano Colorado that Jesus blended for Xikar, which made Cigar Aficionado's Top 25 best cigars of 2009. At the Washington Cigar & Spirits Festival, we'll be featuring two blends from J. Fuego: The Origen Maduro and the Sangre de Toro. Both of these are full bodied blends. The Origen Maduro is a complex cigar made with a blend of Corojo, Criollo and Mexican San Andres, wrapped in a silky Brazilian Matafina wrapper. The Sangre de Toro is a spicy Nicaraguan puro, with a Sun Grown Corojo wrapper and filler blend of Criollo and Corojo tobaccos. Of course no discussion of Jesus Fuego would be complete without mention of the Originals. J. Fuego Originals come in every blend, and are sold as 5 ugly Corona sized cigars in a paper wrapped pack. The good folks at Halfwheel explain the Original really well in this review of the Origen Original, which we've carried at Lit for a few years now. 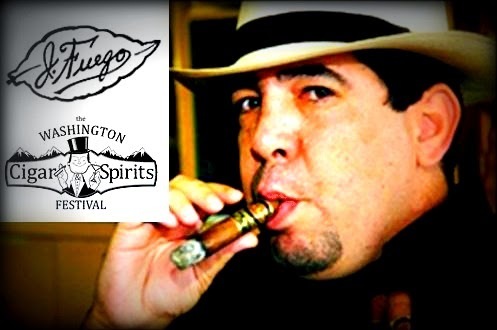 Meet Jesus Fuego at the Washington Cigar & Spirits Festival. Tickets are now on sale via Ticketmaster and at the Casino Box Office. For more information on this event, click here to visit the WCSF page on the casino website with all of our vendors and details.